For the past few weeks, I’ve been bursting with excitement and wanting to write about this new gig but I’ve kept it pretty quiet – just in case. I worked in fitness decades – yes, decades – ago. When I graduated from university, I worked in a bank and taught aerobics, 1980’s (aka Richard Simmons) style aerobics. I had the high-top shoes, the leg warmers, the music. Yup, I was cool and, fortunately, I don’t have any pictures to show you how cool I really was. Since I’ve started to run seriously again, I’ve had this burning desire to get into coaching. I suppose the combination of my Simmons years and teaching experience has ignited this spark, and it’s likely been fuelled by the coaching that I’ve done at school. 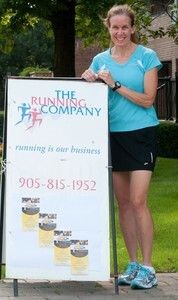 So when I was asked to lead a Run for Fun group at The Running Company, I jumped at the opportunity. This clinic is unique as half of the cost goes towards the target race, 5KSM, or 5K for the Kerr Street Ministries, which will be on October 10th. This means that the participants are doing something for themselves while supporting a local charity. Because of this unique approach, our town’s paper, The Oakville Beaver, wanted to write an article about the clinic and do a photo shoot of yours truly. One hot August morning, dressed in Brooks gear (since Brooks is also sponsoring the target race), I ran up and down the street for about twenty minutes, trying to look fresh, relaxed, happy – okay, to look good. Obviously, those shots were not because the picture that ended up in the paper was the one of me standing next to the sign, or “posing with a sign” as the caption read. Posing! Saturday morning was the first day. There are 17 registered, of which 5 planned to be away for the long weekend. I love the enthusiasm that this green group brings with them. I’m hoping that this might lead to other exciting ventures – what, though, I’m not sure. Right now, it’s new and exciting for me too – the kind of exciting that makes me want to get up early on a Saturday morning, and you can’t beat that. Congrats on doing something you love!!! I think you wil be great at this :). What a great new opportunity–congrats! And can you please post a pic of that vintage aerobics queen look? What a great opportunity! I know you will be a huge source of encouragement/education/motivation to your group. That is awesome. You will do great!